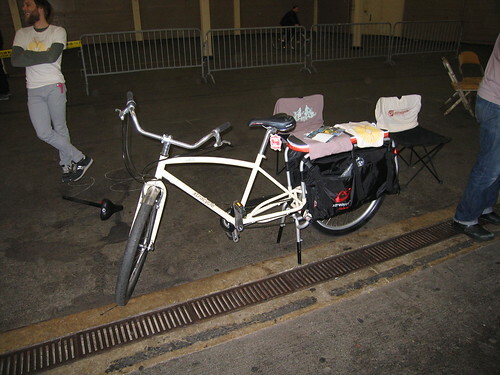 This was the Radish that the Xtracycle gang had onsite today at RideSFO. It was for sale so perhaps it has a happy home now. Note the air freshener on the seat. They had these on their display table. I picked one up and smelled it and asked "What is it supposed to smell like?" The answer: "Fresh air." I'm a little slow on the uptake. Despite this fact, they let me ride the Radish around and it was a delight. Its built like a cruiser. Very stable. And the kickstand of course it rocks. Apparently these are selling quickly so if you want one to put under the tree, you better get on it. However, your radish would look quite strange on a dish.